I was flipping through t.v. channels last night and started watching Picker Sisters and got hooked! Two friends/interior designers, Tanya and Tracy go around the U.S. finding old pieces that people want to discard and transforming them. Their contractor Alan helps to transform the pieces by welding, sawing, painting, etc. I love the idea of taking unexpected materials and turning them into beautiful pieces of furniture. Now I want to go around town finding random things and having someone help me weld, paint, and transform things! Also Tanya and Tracy have great style and I love all their outfits!! *note: the chair they are sitting in was a grain silo! notice the chair on the side? It was a radiator!! 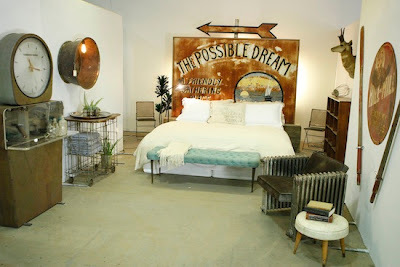 these photos are great - I love recycling and turning things into something else!